At my dental office in Nottingham, we’re dedicated to caring for our neighbors’ smiles no matter what their needs may be. However, we’re limited to seeing only our human neighbors. But that doesn’t mean we can’t provide our animal-loving patients with a few pointers on dental care for their pets. Dental care for pets like dogs and cats isn’t that much different than the dental care we recommend for people. While it may sound silly, brushing your pet’s teeth is just as important as brushing your own. But how do you do it? Start by taking a clean piece of gauze or a toothbrush designed for your animal and some pet-friendly toothpaste (don’t use the human kind). Then gently scrub your pet’s teeth in small circles. Repeat this two or three times a week. This practice can go a long way in fighting tartar and plaque buildup. We also recommended your pet receives a professional, in-depth cleaning at the vet once a year. A proper, healthy diet can help keep your pet’s teeth and overall oral health in good shape. There’s specially formulated food that will help control plaque and tartar formation. Your vet can recommend something that’s best for you. When it comes to snacks, avoid table scraps and choose healthy treats instead. If you notice any of these symptoms, call your vet as soon as possible. 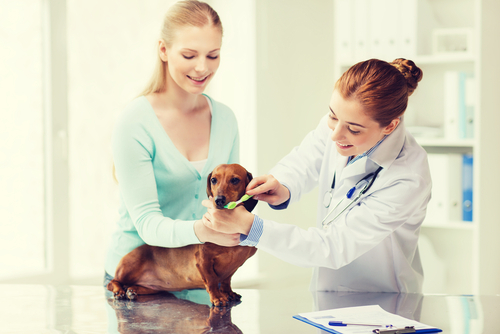 Dental care for pets is very similar to dental care for you, with a few small differences. For your own oral health, remember to brush regularly (twice a day though, not twice a week like your pet), floss daily, and visit my Nottingham dental office at least twice a year. If it’s been awhile since you’ve seen a dentist, give us a call today! Serving patients from Nottingham, Bel Air, Perry Hall, White Marsh and the surrounding areas.